Marijuana plants sit a driveway in Commerce City after feds raid the house Thursday during a black market marijuana investigation. COMMERCE CITY, Colo. — Thousands of marijuana plants were confiscated Thursday morning as part of a nearly two-year federal investigation into alleged black market marijuana operations, Denver7 confirmed. People reported hearing loud sounds and seeing armed law enforcement entering homes in the metro area as the sun came up Thursday. "We just looked outside and saw all kinds of green plants being placed across the driveway and I was really shocked," neighbor Karen Bidgood said. She lives across the street from a home raided near East 114th Avenue and Chambers Drive in Commerce City. Residents in Brighton and other locations in Commerce City reported similar police activity. Denver7 confirmed police activity related to the marijuana investigation in Adams and Arapahoe Counties. "We’ve executed several search warrants regarding illegal marijuana grows," DEA Assistant Special Agent in Charge Deanne Reuter told investigative reporter Jace Larson at the scene of one of the busts. Reuter said she could not provide many details of the investigation, but sources tell Denver7 the grows broke federal and state marijuana laws. "Under federal law, it's illegal no matter what. 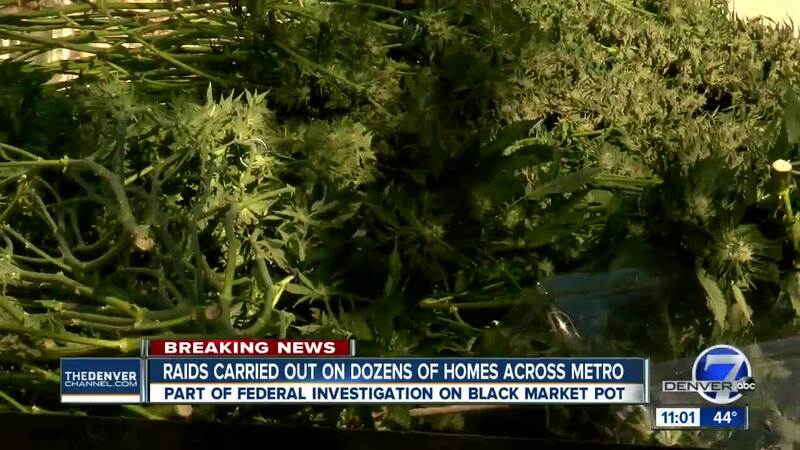 It's an investigation I cannot comment on, but these are black market, illegal grows," Reuter said. The raids were part of a lengthy investigation that included past law enforcement operations in Thornton, Firestone and the Tollgate Crossing neighborhood in Aurora over the past two years. Denver7’s reporting of those incidents and Thursday’s enforcement action indicate about 200 search warrants have been served in total. No one has been charged in conjunction with this lengthy investigation, Reuter confirmed. Denver criminal defense attorney David Beller says this is not uncommon in investigations that take years. "Investigators regularly delay charging defendants for many reasons including leveraging their cooperation and hiding details of an ongoing case from other suspects," Beller said. "Once a case is filed, a defendant has due process rights, meaning they have complete access to all reports, interviews, and moves of the investigation."